(CNN) -- Rafael Cabrera-Bello fired a sensational 11-under-par 60 to win his first European Tour title and deny Benn Barham a wire-to-wire victory at the Austrian Open on Sunday. 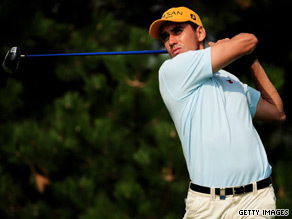 Rafael Cabrera-Bello became only the 13th player to score 60 on the European Tour. The Spaniard won by one stroke from the Englishman as he only just failed in his bid to become the first player to shoot 59 on the European Tour. The 25-year-old faced a 30-foot eagle putt on the last hole in Vienna to create history, but he two-putted for a birdie which was enough to give him a one-shot clubhouse lead. Barham came to the final hole needing a birdie to force a playoff and keep alive his hopes of a first win on the tour and secure his card for next season, but drove into the rough and could only par for a closing 69. The 33-year-old had led by three strokes going into the final round, but managed only eight pars and a bogey on his front nine, while Cabrera-Bello -- who was fourth as an amateur at the 2002 Spanish Open -- fired a hat-trick of birdies from the third hole and then four in a row from the eighth to share the lead. Ryder Cup star Soren Hansen also joined them on 16-under after an outward 33, but Cabrera-Bello moved clear with birdies at 13, 14, 16 and 18 to card a four-round total of 20-under 264. Hansen, the highest-ranked player in the field at 42nd in the world, birdied 13 but dropped a shot at 17 before closing with a birdie to card 68 and finish three shots behind the winner. It was his second successive third-placed finish following last weekend's Mercedes-Benz Championship in Cologne. The victory lifted world No. 220 Cabrera-Bello to 46th on the Race To Dubai money list as he ended a run of eight missed cuts in his last 10 starts. "It's just amazing -- I played the best golf of my life and I can't believe it," he told the European Tour's official Web site. "I was so far back I wasn't thinking about winning. I just tried to play a shot at a time and today it worked out really, really good." Barham is still outside the 115th place, needed to retain his card, but moved up to 126th, meaning he is still in danger of having to return to qualifying school. England's Richard Bland finished fourth on 15-under after closing with 66, while South Africa's Louis Oosthuizen was fifth another shot back after a 69.